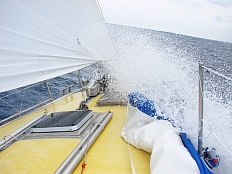 First leg of the season to convey Nanuq from Umeå / Gulf of Bothnia to Copenhagen, port of embarkation for the expedition 2015/2016: 750 nautical miles in straight line, 890 actual miles because of continuing contrary conditions forcing us to beat against wind and currents for 6 days. 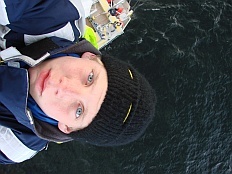 An excellent appetizer and an opportunity to test the boat and crew after a winter spent in the Scandinavian ice ... and at office. Only one seal of the diesel system played tricks. 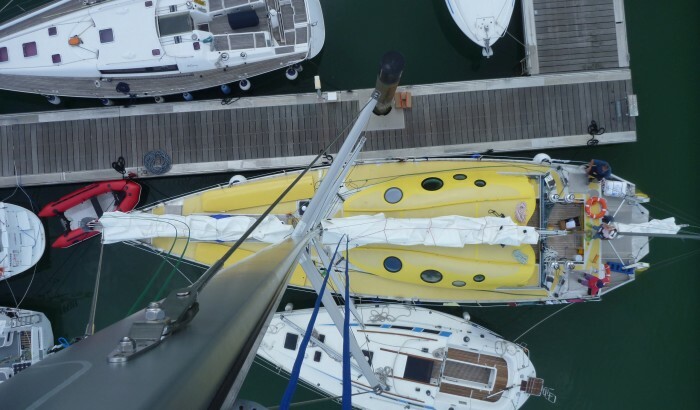 This was also a great opportunity to list improvements to comfort in anticipation to possible rough conditions and a numerous crew this summer. As for the departure from Umeå, the morning brought us a last snow shower, quickly replaced by bright but still cold sunshine. 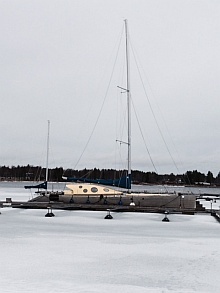 All members of the sailing club Umea Segelsällskap  were gathered to wish good luck to Nanuq, accompanied for the occasion by the local press and TV. 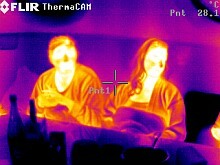 A beautiful moment of sharing and friendship and invaluable hands to resolve some of the remaining technical details. Hope to come back to Obbola! 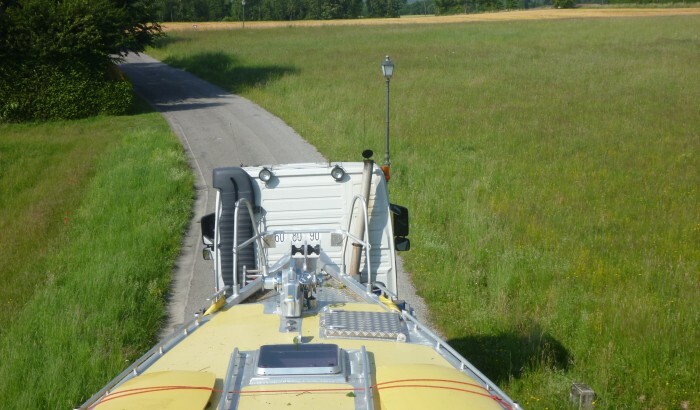 During the final weeks of preparation, Nanuq will be waiting on her mooring overlooking Øresund bridge that connects Copenhagen to Malmö, eager to sail North, for good! The passive igloo offers accomodation to master students, doctoral students and researchers motivated by an interest and passion towards research in the Arctic regions, whether sailing in the summer during escorts or during Arctic winters during which the vessel is stationary in the ice. Several scientific partners are enroled : Météo-France, Oceaneye, University of Brest, University Savoie Mont Blanc, INRA and University of Geneva. Topics of study cover weather, climate, biodiversity and pollution of the oceans. 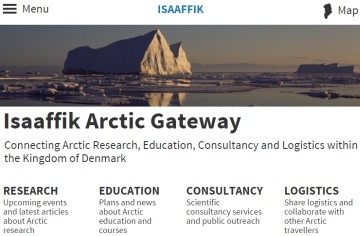 The passive igloo is also involved in Isaaffik, a new gateway connecting Arctic research, education, consultancy and logistics. This is no April fool: free water is only 30 meters away from Nanuq. Everything happens for the best under the watchful eye of our Swedish friends in Bredvik Harbour (Obbola). 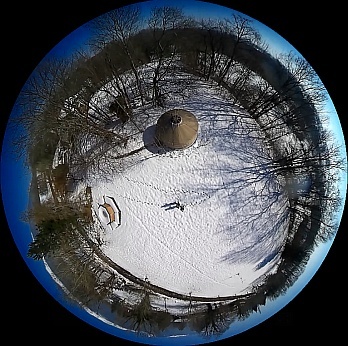 Photo credit : Martin E.
Testing 360° imaging, some from our Drone (views of our basecamp). 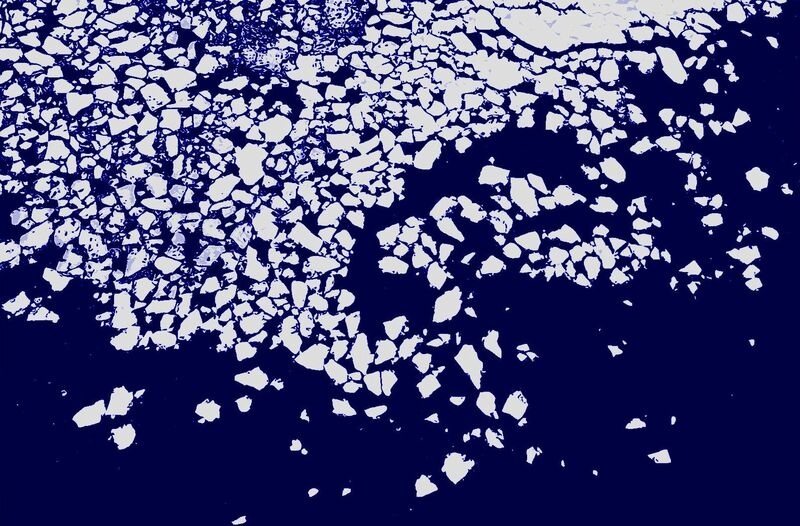 We are pleased to announce the collaboration with the Association Oceaneye to collect seawater samples in 2015 and 2016 in the polar regions of the northern hemisphere. to contribute to the study and analysis of the problem, its causes and effects following a scientific approach. Online data are no longer available - sorry! 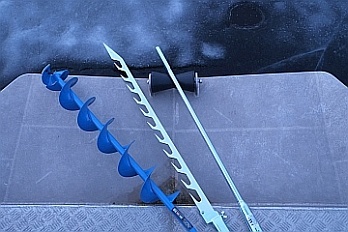 The last few days have been busy equipping Nanuq with essential tools that only the northern peoples know how to make: ice pick, ice saw, drill ... all are sharper one than the other. 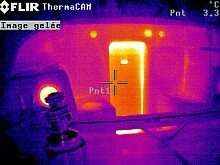 Ice is 'machined' like wood! On board, life is comfortably installed. We spend our days between visits, receptions on board, and relaxing moments of reading, writing or development. We feel more and more at home in this little world that has become ours, knowing that it is only a parenthesis. 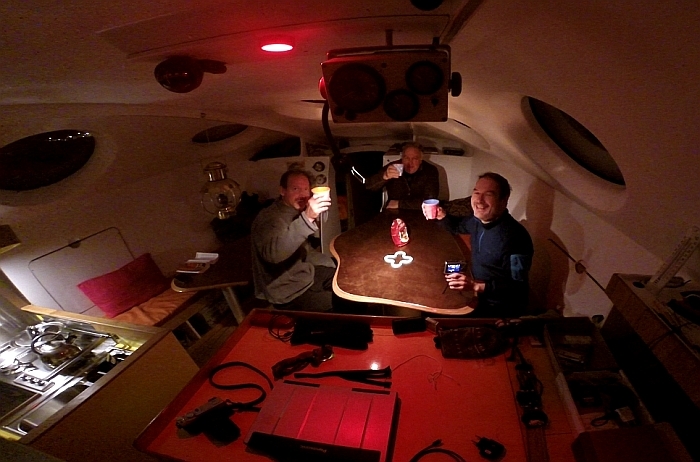 The nanuq crew wishes you all a Happy New Year 2015 - Cheers ! 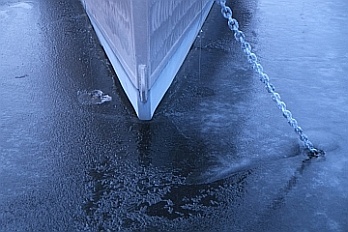 Nanuq performs in the newly formed ice. After traveling to northern Europe accumulating delays due to snow and a night travel by bus we finally arrive on board. Outside temperature is -18°C. In the absence of life on board the cabin air temperature is still above -5°C thanks to the water close to 0°C under the 15cm of fresh ice. The sun rises with difficulty a few degrees above the horizon before sinking again. 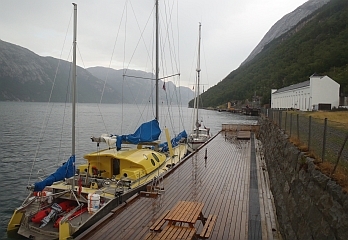 After a fantastic welcome by our Swedish friends and getting various systems and the little wood stove to work, we settle for a week on board and to initiate a year that promises to be rich in encounters and discoveries. 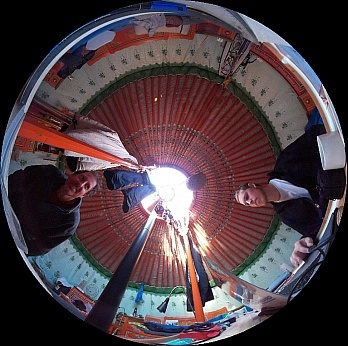 Frantic preparation, the base camp is installed in the Yurt. Scandinavia from Team Nanuq on Vimeo. 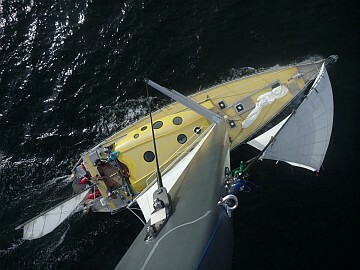 France-Norway from Team Nanuq on Vimeo. 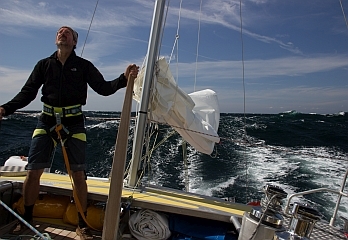 Geneva-LaRochelle from Team Nanuq on Vimeo. The passive igloo project has been present at the 18th status-seminar : Forschen für den Bau im Kontext von Energie und Umwelt, held the 4. and 5. of September 2014 at ETH-Zürich, Maschinenlabor (poster). 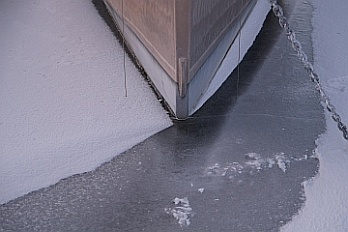 During the winter 2013-2014 a 5-day-5-crew trial has proven that during temperate winters (-5°to +5°C ambient temperature) thermal performance and comfort are adequate without any need of heating. Monitoring of indoor air quality showed satisfactory results and points out the importance not to make use of candles or petroleum lamps. 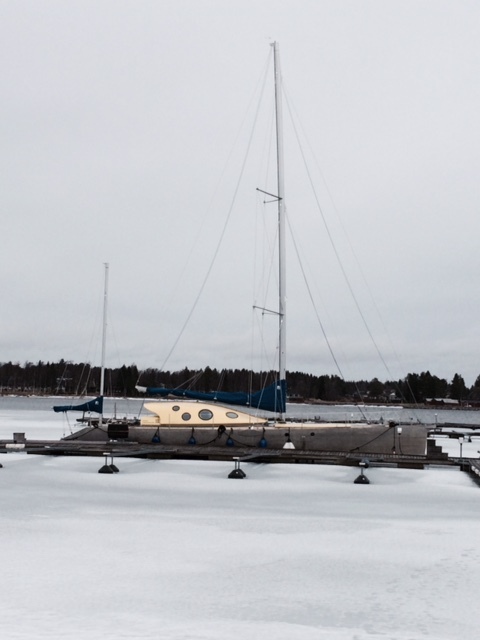 The boat has been launched in June 2014 and given a successful 3000 nautical miles trial run from La Rochelle to Gulf of Bothnia where she will go through an ice test during the Scandinavian winter 2014-2015. The arctic winter expedition is planned for 2015-2016. During one year (8-12 months) a scientific monitoring will document the operation and performance of the different systems. 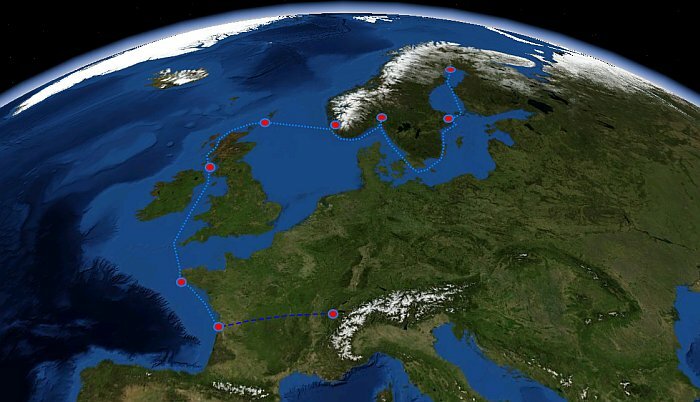 Since the departure from Geneva, we sailed 3000 nautical miles, from La Rochelle to northern Europe via Scotland, the North Sea and Norway. 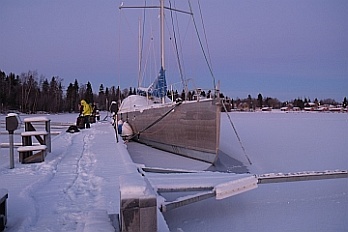 This trial run was essential for the testing of a brand new boat, designed and built for expeditions to the North. Technology choices and innovative systems have performed without significant problems. At each stop, 'nanuq' generates interest and fascinates the general public as well as experts. As her predecessors' nanuq sails well and is very pleasant to manoeuver, even for beginners, despite a sturdy construction capable of withstanding the most difficult sea conditions and ice. 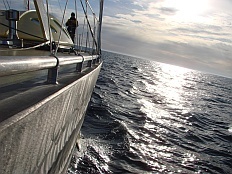 Fast, the boat provides good performance, reaching an average speed of 10 knots and even a peak of 19 knots. Safe and secure in strong wind and rough sea, 'nanuq' is very handy to sail due to its efficient rigging split into several sails. 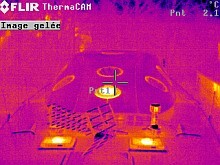 Also the motor proved to be efficient. Comfortable and friendly, one lives as well as at home. Cohabitation is convenient for a crew of 8 to 10 during legs of 2 weeks. With its enhanced thermal insulation, the bright living area is a friendly place, always warm and dry regardless of weather conditions, even without heating. The big outside cockpit allows the crew to enjoy the sunny days and fresh air. 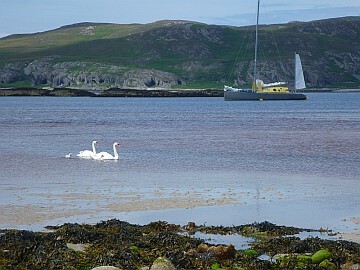 The experience gained during this season let us consider sailing to rough and remote places. 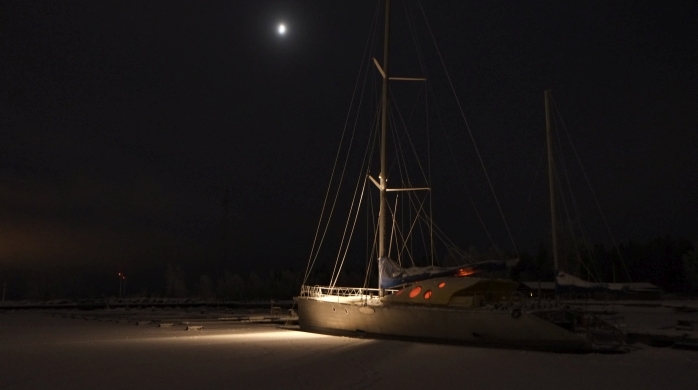 This coming winter in Scandinavia will be used to test the boat in a situation of cold and ice, as well as to prepare the expedition and the scientific projects that will be embarked in June 2015-16 for the far North.